Sorry mom, it was just too good of a topic to leave just for you! 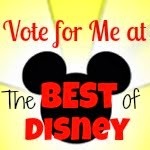 A few weeks ago, my mom blogged about her top 10 Disney memories. If you missed it, check it out here. Needless to say, it got me thinking about mine. Some are similar, some totally different. 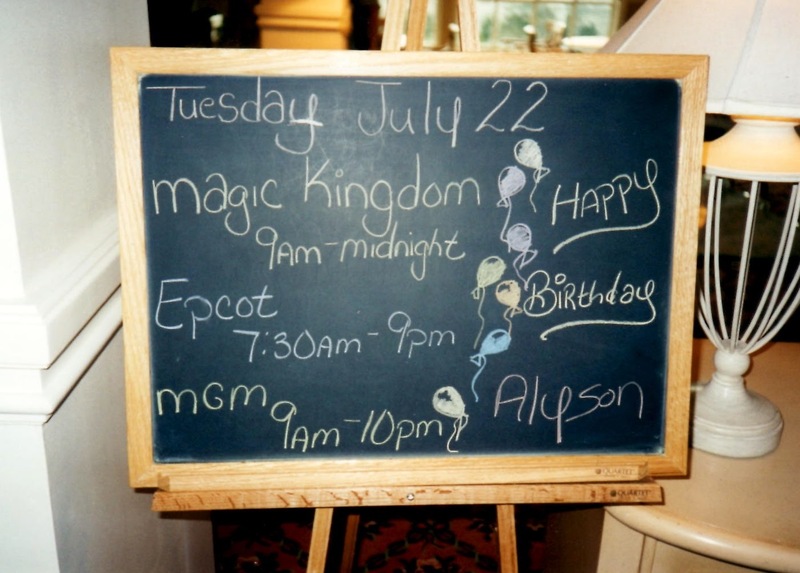 Here’s my trip down memory lane—my top 10 Disney memories. 10. Food contests between me and my cousin. Growing up, we traveled to WDW together pretty much every other summer. My parents always wanted to eat at new restaurants, so they challenged us to eat as many different things as possible. Alligator. Yep. Sweatbread. That too. Oh, and we were not at all encouraged to show any self-control! Eat up! 9. Eating at 50’s Prime Time Café for the first time. Okay, I can’t really remember it that clearly, but I can say it made an impression. To this day, and silly as it sounds, that is my favorite place to eat! I can’t get enough of the s’mores or peanut butter and jelly milkshake. 8. Tower of Terror memories—gotta put two here. When ToT first opened in Disney World, rode as a family. It was the beginning of those pictures that they took on the rides, and when we got off, there was the most perfect picture of my dad, elbows out in front of everyone else, with a toothy grin, while all of us had a look of terror. That image is etched in my brain, and we so regret not purchasing the picture! About a decade later, I got to ride ToT with my (now) hubby for his first ride. He didn’t know what to expect, but at that first drop, his hand grabbed my thigh in pure fear. It was awesomely funny. I will never let him live that down! 7. Losing our backpack on the Indiana Jones ride in Disneyland. Nothing said these all have to be happy, exciting ones. We loaded on the ride, and I thought my hubby had the backpack, he thought I did. One sharp turn and it flew out the side of the ride—camera, medals, sunglasses…all included. Ugh! We had to go back a few hours later when they shut down the ride to retrieve all the lost belongings. They were so awesome in helping us, and even got us to jump the line to ride Big Thunder Mountain Railroad just to make our day a little better. Disney definitely does customer service right! 5. Getting sick at Disney World. Yep, it was terrible. We had planned a huge 10-day vacation --following my first Goofy Challenge. Dining, park time, the works! Well, the day after Goofy I started feeling ill and it went downhill FAST. I ended up taking a taxi to the urgent care and on antibiotics. No good meals; no fast rides. By the end of the trip, it started to turn around, but let’s just say I will not be getting the Cobb salad at the Brown Derby anytime soon! 4. 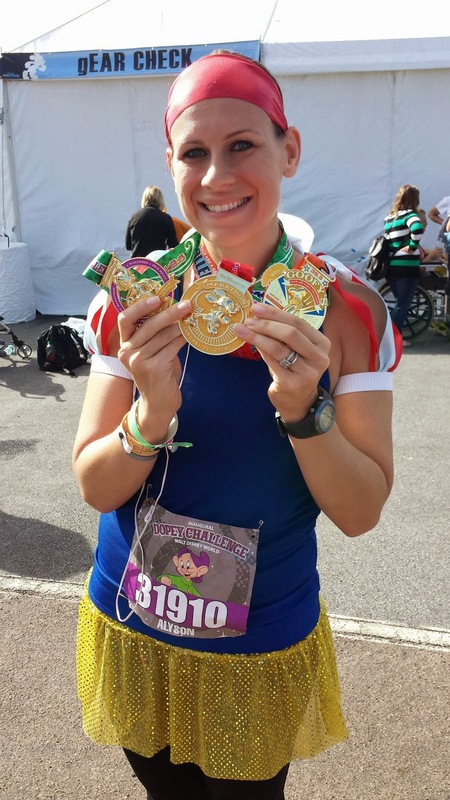 Running, finishing, and getting a marathon PR during the inaugural Dopey Challenge. I cannot tell you how much that race meant to me. I doubted myself right up to the end, but when I crossed that finish line, I really believed I could do anything. I would have been elated just to finish, but to crush my previous marathon PR…that was simply amazing! 3. Dancing in the Magic Kingdom AND Epcot. Growing up, my dance studio director was also a Disney lover. The summer after my junior year in high school, we were invited to dance at the Magic Music Days and perform at BOTH parks (if you don’t know, that wasn’t done often; we were told we were the first). This summer, the studio is getting to dance in Disneyland Paris—c’mon Miss Donna…don’t you need alumni chaperones? 2. 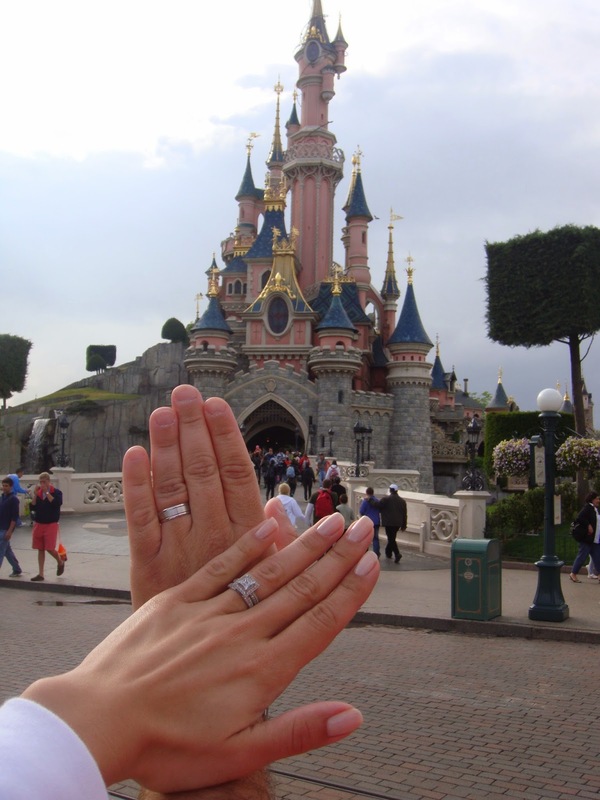 Honeymooning in Disneyland Paris. We started our honeymoon with a few days in Disneyland Paris. It was really fun to see the similarities and differences. We sprung for the most amazing suite with a balcony that overlooked the castle. We even had our own private elevator to get to the park. 1. Getting engaged in front of Cinderella Castle. Yep, every little girl’s dream! My hubby did an AMAZING job surprising me by dropping to one knee at that magical spot. I was completely surprised. A few cast members saw the whole thing and brought us a Mickey and Minnie wedding statue as a gift from the big cheese. Every time we go back, we always visit “our spot” and have quite the collection of pics of our feet standing there! What are your favorite Disney memories? I LOVED the 50's Prime Time Cafe! My mom went with me for marathon weekend last year and we ended up there because there wasn't a line and the food looked good. We've had this inside joke for years about this wall hanging that my grandma had in her houses and every so often it shows up on a 50's or 60's TV show. Well, the wall hanging was in the restaurant. I'm sure the people thought we were out of our minds laughing about this thing following us to Disney World. I just cannot get enough of that place! I even made my hubby promise we can stop and get a milkshake during wine and dine.